I kicked off the start of the long weekend by going on a marathon yard sale spree this morning. The next three weekends are going to be crazy busy, so I’m trying to spend most of this weekend on my own, doing projects around the house and just nurturing the introvert in me by interacting with very few people. The day was off to a rather inauspicious start when I got out at the first yard sale only to discover that there was no person around but a dog tied to the stuff — a rather unhappy dog. I’m a dog person, but this dog seemed pretty serious about not wanting anyone to shop in his yard, so I got back into my car irritated that I had driven to that yard sale only to be turned away by a dog. Things picked up after that though. My dad will be happy to know that I picked up a shovel for $5. Now when he goes to look for his shovel, he can look in his garage instead of mine. For $3, I was able to get four serving bowls and a platter, so I made progress on the goal of acquiring more serving dishes to entertain (and, yes, I do have a dinner planned at my house next Friday night and used a serving dish acquired earlier this year last Friday night). Here are the top 5 most interesting finds of the day though. Disclaimer: The picture doesn’t quite do this piece justice. I have a little buyers remorse about this piece because I don’t currently have a place in the house for it. If I hadn’t already primed the guest bedroom nightstand and planned out some cool embellishments for it, I’d put this in the guest bedroom. But, for now, it’s going to be in the basement waiting for a role to play. 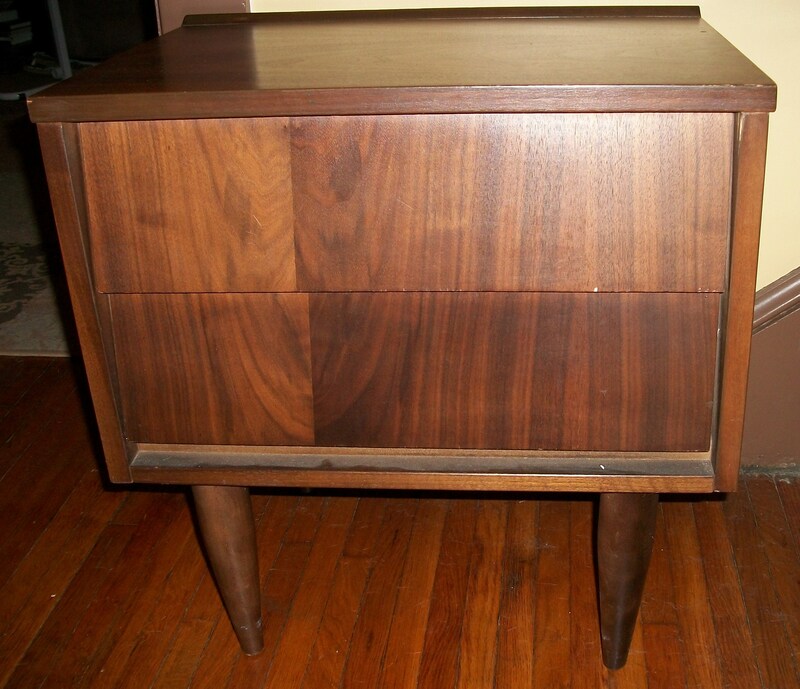 I’m such a sucker for retro furniture that has clean lines. The picture doesn’t show it too well, but the drawer fronts are slanted slightly, which means they become handles. For $5, I had a hard time passing the nightstand up. I hope that at some point in the future, I find the perfect place for it. I do know where I’m going to put this lamp. It’s going to go on the guest bedroom nightstand when I get it painted. I like its modern look, and the base is just under two feet tall, so the lamp has presence. I might have to do a little searching to find a shade proportionate to the size of the lamp, but it’s going to be a fun addition to the room. And, it’s an economical addition as well since I only had to pay $2. 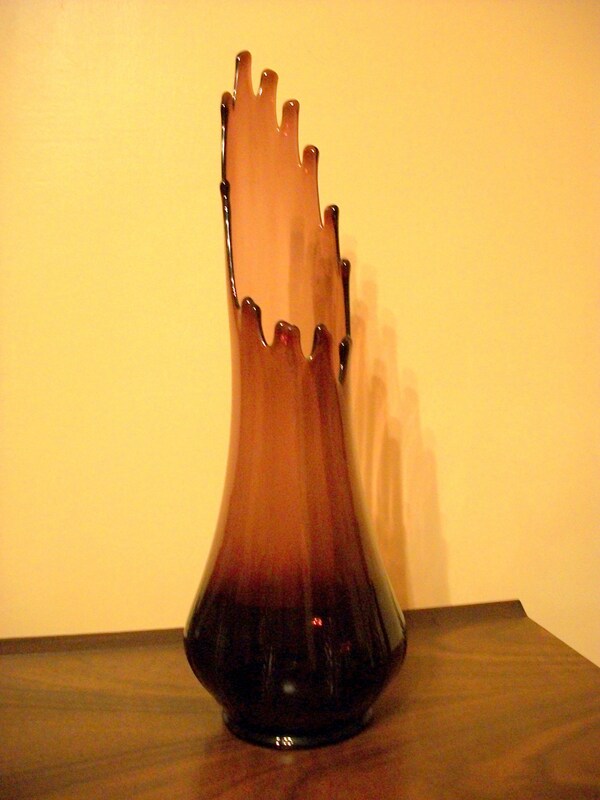 I had a tough time getting a good picture of this vase, but it’s a fun piece of glass with the asymmetrical uneven rim. This isn’t something I’ll leave out all the time since I have no purple rooms in the house, but for 25 cents, the vase was worth snagging as a future party accessory. One of the librarians at work used to be a floral designer, so I bet she can even give me some great tips about how to arrange some flowers in it. I felt even better about the deal when I saw the $12.99 TJ Maxx sticker on the bottom of the vase when I was putting it away. And, speaking of deals, I wound up getting a $60 Black and Decker Espresso Mio microwave espresso beverage kit still in the box for FREE. I had already been to many yard sales and was getting close to the max that I wanted to spend for the morning, so I picked this up and looked it over. The lady wanted $4 for it though, and I do have an espresso machine already. I was (and still am) skeptical that espresso can be made in the microwave. So, I decided to pass. I was looking around at some other stuff, and the lady walked up to me and said, “Hey, if you want that espresso maker, just take it. It didn’t sell last year either. If it doesn’t work, you’ll have nothing to lose.” So, I took it. I’m thinking that my day off on Monday should start with an espresso experiment. And, that deal was followed by another, perhaps even better one. My mom and I were just talking the other day about how her vacuum is not working well at all. Her long-haired dog is doing a number on it, and the bag fills too quickly, so we had chatted about how she should go bagless next time. I also have this wonderful attachment for my vacuum that works wonders for getting the dog hair out of the couch, and my mom had commented that some of the major vacuum manufacturers now seem to include it in their pet vacuum packages (as they should since the attachment has never ceased to amaze me). I found these people with half of their house on the driveway since they were packing up and getting ready to move to Florida, and there was the $150 Bissell Pet Hair Eraser vacuum that looked nearly brand new with all the attachments (including the amazing one) and the manual for $75. And, I talked them down to $65. You’re welcome, mom! I even tested it on my carpet tonight, and I’m really grossed out by how much hair it got out of the living room carpet. Maybe it’s time to clean the filters on my vacuum. With all the crazy busy weekends ahead, that might have been my last yard sale trip for the season, but I’d say I went out with a bang. This entry was posted in decorating, that's life and tagged coffee, lamps, yard sales. Bookmark the permalink. Do you still have a whole room decorated in purple? I also still have one more pillow cover that never got stuffed, but I thought you stopped using those pillows.